There’s an app for that if you’re looking to access a utility bill, consumption and conservation numbers as well as instant outage notifications on your mobile phone. 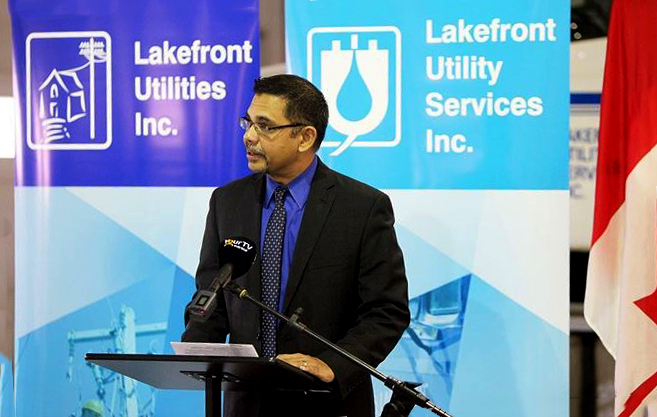 On Nov. 23, Lakefront Utility Services Inc. (LUSI) joined its partners and Northumberland−Peterborough South MP Kim Rudd to launch the first mobile utility program for a telephone in Ontario. During a stopover at the utility’s garage on Ewart Street in Cobourg, Rudd said these announcements are some of her favourite, because she knows how important and truly transformative they are, and what they mean for everyone in eastern Ontario. 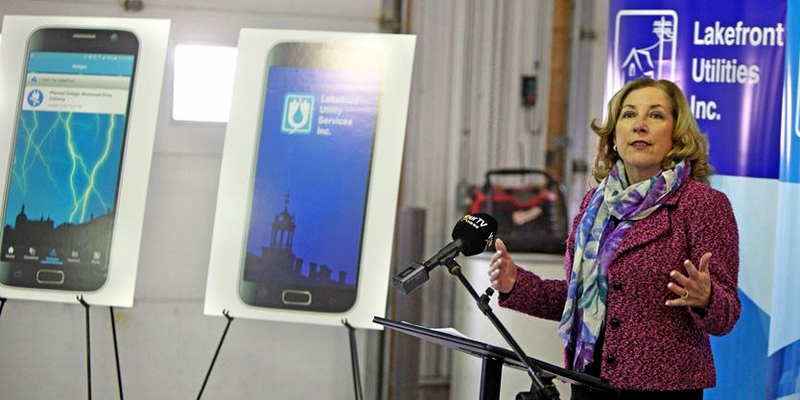 Northumberland−Peterborough South MP Kim Rudd, the parliamentary secretary to the minister of natural resources, visited the Lakefront Utility Services Inc. garage at 25 Ewart St. in Cobourg to help launch a new mobile application. It expands upon Lakefront’s current customer service programs by providing billing, consumption and conservation information, as well as instant outage notifications and news all from the convenience of their customers’ mobile device. 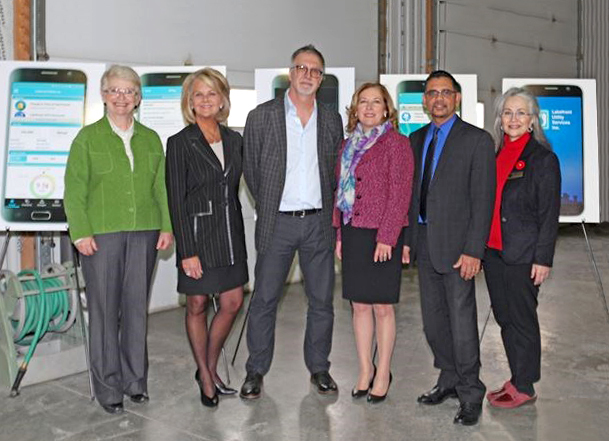 Northumberland−Peterborough South MP Kim Rudd, third from right, the parliamentary secretary to the minister of natural resources, visited the Lakefront Utility Services Inc. garage at 25 Ewart St. in Cobourg on Nov. 23 to help launch a new mobile application. She was joined by, from left, Prince Edward Lennox and Addington Community Futures Development Corporation chair Angela Miller, Northumberland Community Futures Development Corporation executive director Wendy Curtis, Screaming Power CEO Gary Michor, Rudd, Lakefront Utility Services Inc. president Dereck Paul, and Town of Cobourg Councillor Deb McCarthy. Flanked by representatives from Screaming Power Inc. who developed the app, several councillors from the Town of Cobourg and the Northumberland Community Futures Development Corporation (CFDC), the MP said that the new app is not simply a collection of over 550,000 lines of code. Rudd said that vision, drive and quest to bring real time data to customers had been realized that day. According to LUSI, customers are encouraged to download the app for free on Android and Apple iOS devices by searching Lakefront Utilities at the Google Play Store or the App Store. This application has been made possible through the assistance of Screaming Power, Cornerstone Hydro Electric Concepts, the Federal Economic Development Agency for Southern Ontario’s Eastern Ontario Development Programs Collaborative Economic Development Projects (CEDP stream) delivered by Northumberland CFDC and the Ontario Centres of Excellence.